I met certified crystal specialist, Rashia Bell, co-founder of THE CRISTALLINE in New York, during the 92Y 2018 "City of Tomorrow" Summit. We participated in the "Applying Healing and Wellness Modalities to Design" panel talk, along with Ellie Burrows and Deborah Hanekamp. After meeting Rashia and discussing the principles of Crystal Healing and Feng Shui, I thought, what a great combination of holistic practices! Rashia has taken the time to share her wisdom and insights into the world of crystals and how you could use them inside your home. Question: What is Crystal Healing? Crystal Healing is essentially using crystals to help harmonize and balance energy within the body. The foundation of it is the chakra points, as they are a subsystem of energetic pathways or channels within the body. Crystals hold energy based on how they were created by the earth and this energy allows specific stones to resonate with certain chakra points. The goal is to keep these pathways clear, but with the stress of life’s twist and turns this can prevent us from maintaining that homeostasis. In a one-on-one crystal healing session, natural stones are placed on each of the chakra points as you are led through a meditation and visualization that is being documented by the practitioner. Throughout the sessions the stones are being changed based on the energetic responses to help clear and remove any energetic blockages. Question: How Do we Select Crystals? Visit a place that you can trust that has a knowledgeable staff. Listen to your intuition when being guided to a stone. It may not be the one you think you need, but most often is the one that you are energetically aligned with and will work for you. Most important is to touch the stone, feel the temperature and weight differences. Take the time to do so and don’t second guess your selection, just bring it home and let it do it’s work. Question : What crystals do you recommend every home to have? Stones that are the utmost important in a home fall into two camps, clearing and grounding. The way we incorporate stones into the home is guided by the same principles as used in crystal healing on the body. We approach incorporating crystals into the home from the perspective of examining what is going on energetically with the people that inhabit the space. Clearing stones are those that have the ability to clear energy. Clear Quartz, Himalayan Salt, and Selenite can be used to help purify and clear the environment. The grounding stones I feel are most important in a home are those that help block electromagnetic frequencies. 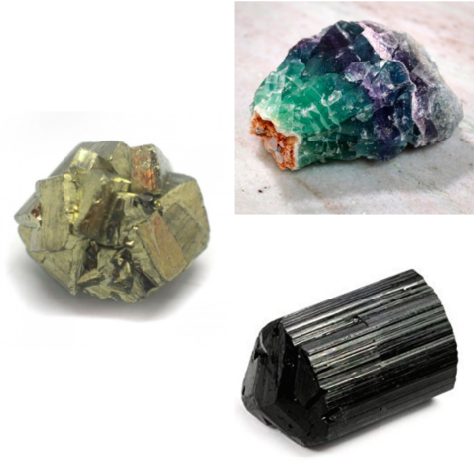 You could use Black Tourmaline, Obsidian, Onyx, Pyrite, Hematite (the non-magnetic type if you are using on a device) or Fluorite. I place pieces of these stones on cable boxes, wifi modems, and on my cell phone at night. Just like with Feng Shui, Crystal Healing also promotes the practice of removing electronics from inside your bedroom. Rashia suggests, "at a minimum your phone should be across the room because even if it is off you most likely still have it plugged into the wall and electricity is coursing through it. These stones can also act as a shield around you. Placing them around the perimeter of the bed may be useful." Question: Is there scientific research that supports the use of crystals? In the late 1800’s Pierre Curie & his brother Jaques, whom are both scientists, did studies on Tourmaline and other crystals and the ability of the stone to produce a weak charge of negative ions. That Ion creates pryoelectricity which has the ability to counteract the EMF. You could also read "New way to absorb electromagnetic radiation demonstrated" published in 2016 by Moscow Institute of Physics and Technology. The challenge when it comes to crystal healing in particular is no to experiences are alike. Because none of us as individuals have the exact same composition, or have had the same life experiences. I really think working with crystals is about learning to trust yourself. What you feel yet can’t necessarily explain. That is why I love to work with children, because they don’t question themselves or their experiences and their energy is much clearer so they have the ability to resonate with the energy of stones very easily. Have you heard of American author, Stephen King? He has written more than fifty books within the genre of horror, supernatural fiction, suspense, science fiction, and fantasy. And all of his books are worldwide bestsellers. So, how does Mr. King get into the FLOW of writing and stay there? Paralleling Ecological Psychology and Feng Shui, the more SPECIFIC your INTENTIONS are, the better you can define your OVERALL ROOM ARRANGEMENT and enhance the energetic frequencies to be in your favor. What is the FUNCTION of that room? Are you using it to create artwork, to write, to sleep or to cook? Decide on the best layout for the room to cultivate optimal physical and energetic movement throughout that space. In Feng Shui we refer to this as setting up a “commanding position.” The main pieces of furniture for the room establish a starting point to build out from with the rest of the arrangement (i.e. desk, bed, couch). Assess the harmony or disharmony of the FIVE ELEMENTS within the room and make adjustments accordingly. Each element (Fire, Earth, Metal, Water, Wood) corresponds with a personality trait and characteristic that enhances both your inner and environmental chi. To go a step further, you could even include EARTH ACUPUNCTURE. The earth is crisscrossed with meridians (lines of energy), and just like with the home environment and body, the flow of energy could become blocked or stagnated through the land directly. This is referred to as, geopathic stress. Using certain tools that are embedded into the land helps reestablish energetic harmony. Choose visual images or objects on DISPLAY to induce your best performance based on your personal intentions and function of the room. If your pursuits require additional self-development discovers and practices, be sure to induced that into you daily routine (e.g., meditation, inner child work, emotional intelligence, etc). To some, this information may seem esoteric, yet science is stepping in to PROVE the benefits of these Ecological Feng Shui practices. The best way to know is to experience it for yourself. You are a reflection of the space you occupy (e.g., home, work, land) and that space is a reflection of you. If you do not like what you see, make changes internally and externally. Stulberg, Brad and Magness, Steven, “Peak Performance,” pg 132. New York: Rodale 2017. Print.